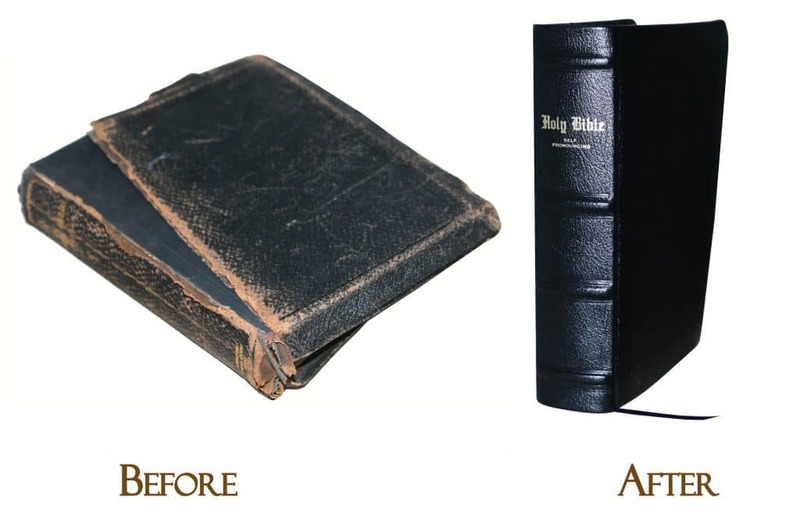 We have a large selection of the finest leathers, goatskin, sheepskin and exotic skins from around the world for any Bible recovering. 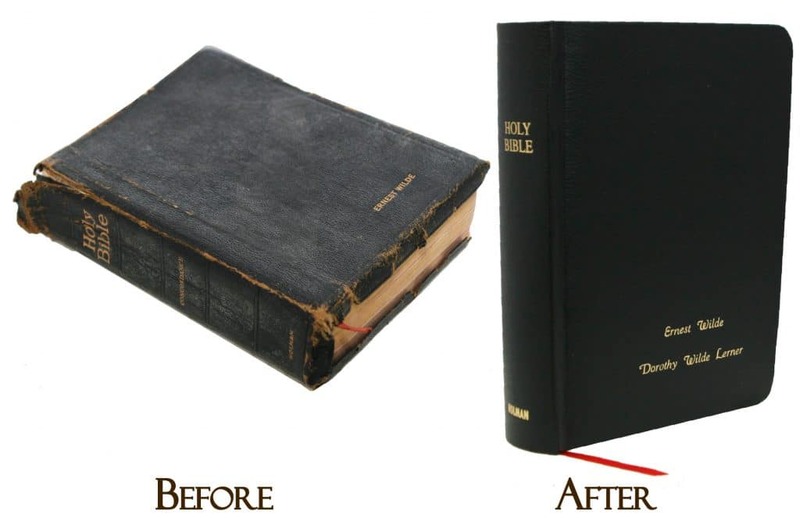 We can also nearly "replicate" the look of your Bible with virtually identical foil stamp applications. 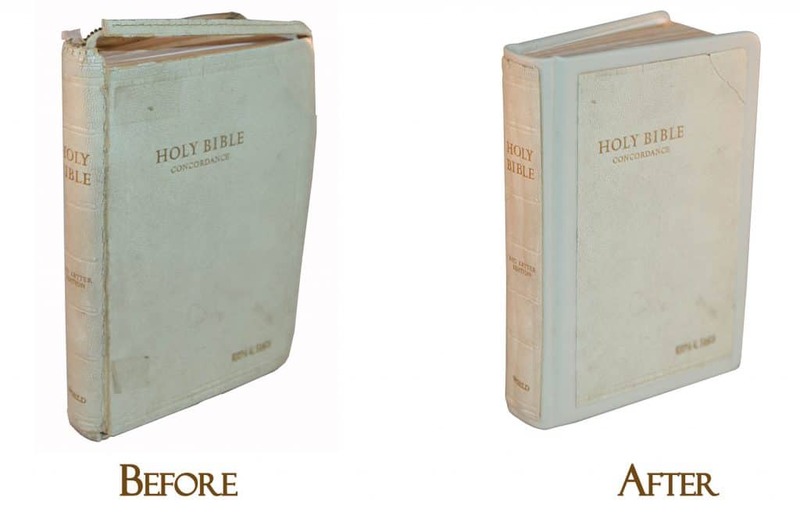 The photos below are some examples of how we perform a Bible recovering. 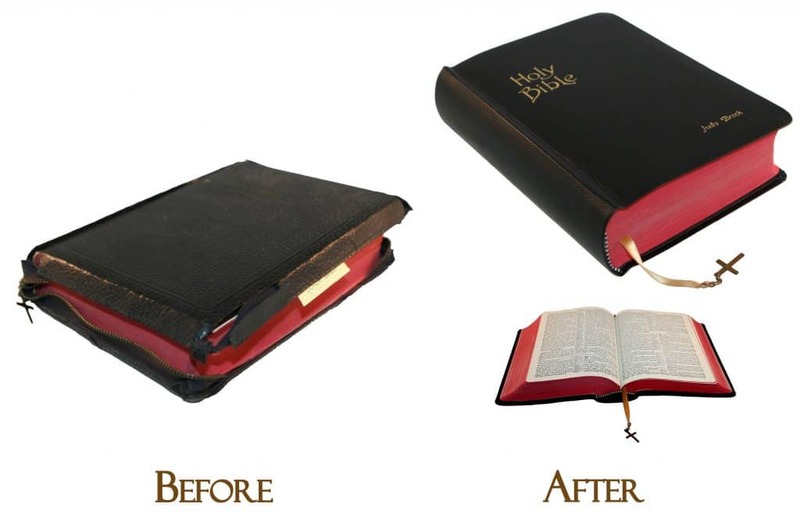 If you are looking to recover your Bible with a new cover, then our Bible rebinding service is for you. 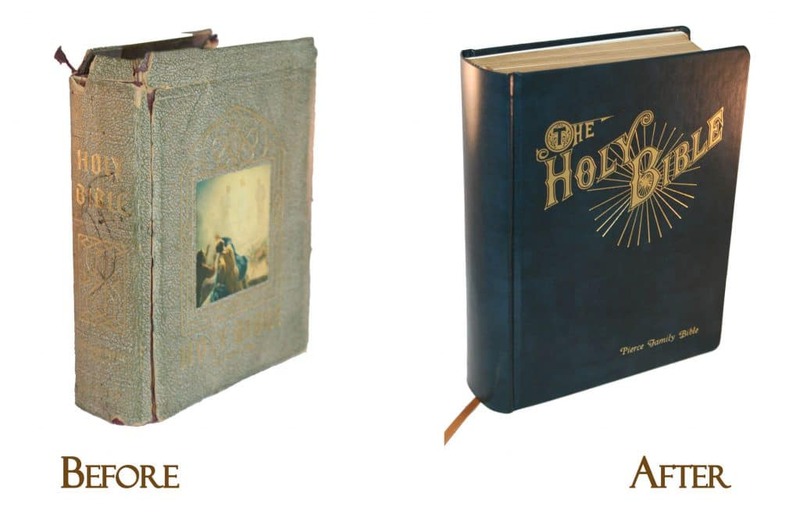 See Bible Rebinding with a New Cover for more information. 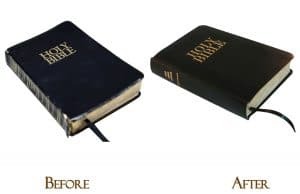 If you are ready to GET STARTED to get a new cover, click on Get Started on Bible Rebinding/Bible Recovering. 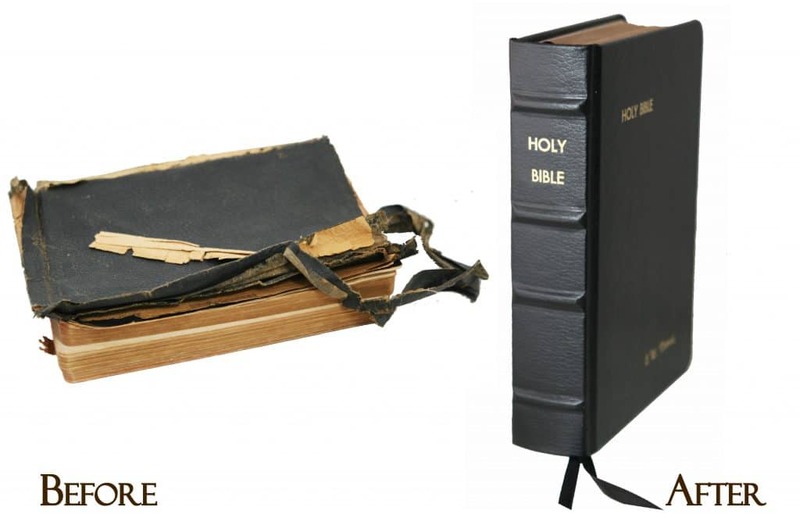 Our bookbindery often receives Bibles with Yapp covers (extended leather covers that hang over the side of the Bible) that were designed to protect the pages, but are now damaged, broken or torn. Some people refer to these extended leather covers as "yapps". These yapps come in several variations, such as a full yapp, semi-yapp and there are yapps with zippers. While time and conditions may cause these yapps to become damaged, in some cases, the leather covers were made with an inferior quality bonded leather. The repetitive bending of this material leads to deterioration and cause damage to the Bible pages that they were intended to protect. Also, we have seen numerous instances where zippers attached to the extended cover have failed. We have heard some complaints that these extended flap covers seem to get in the way when pages are turned. 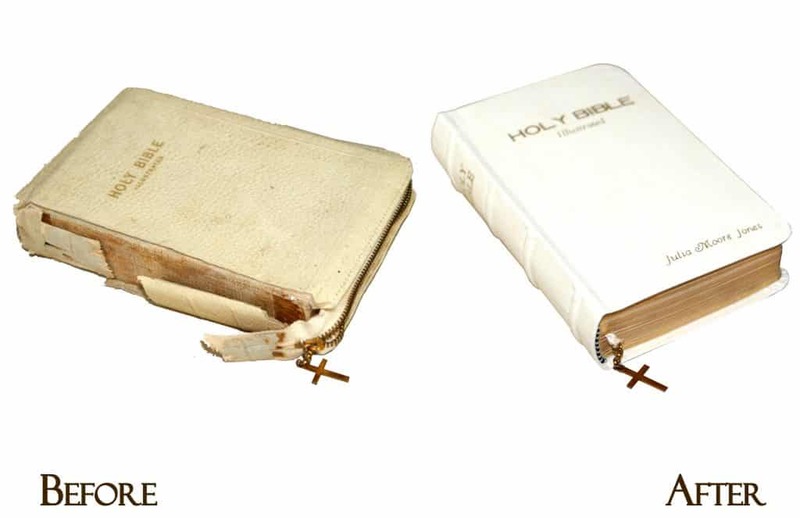 Our solution to this problem is to rebind the Bibles with NEW covers without recreating the extended flaps (Yapp). 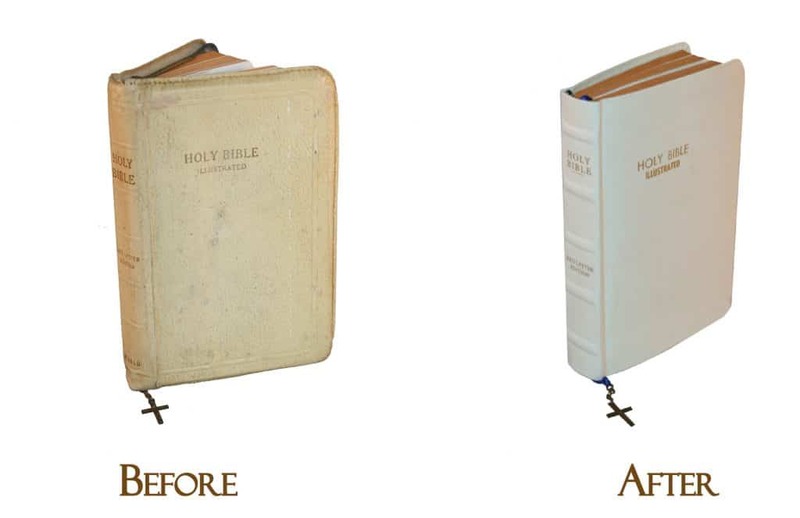 As a result, our Bible rebinding service results in a clean look. 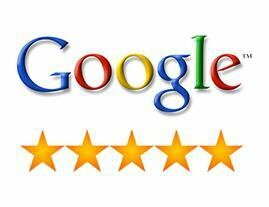 We do not believe making extended flaps or Yapp covers are the best long-term solution. 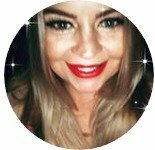 However, in most instances, we can save all or a portion of an existing cover, especially when a cover has special sentimental value. 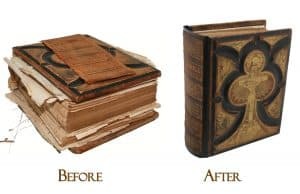 We have numerous techniques that are outlined in our Bible restoration page that we use to save all or a portion of existing original Bible covers. 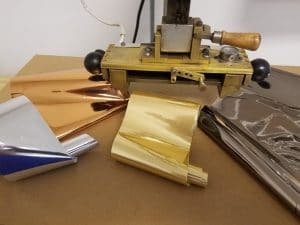 Alternatively, we have a tremendous selection of leathers, goatskin, cow skin and other materials to select that can be found on our Bible rebinding page where we can make you a new Bible cover. 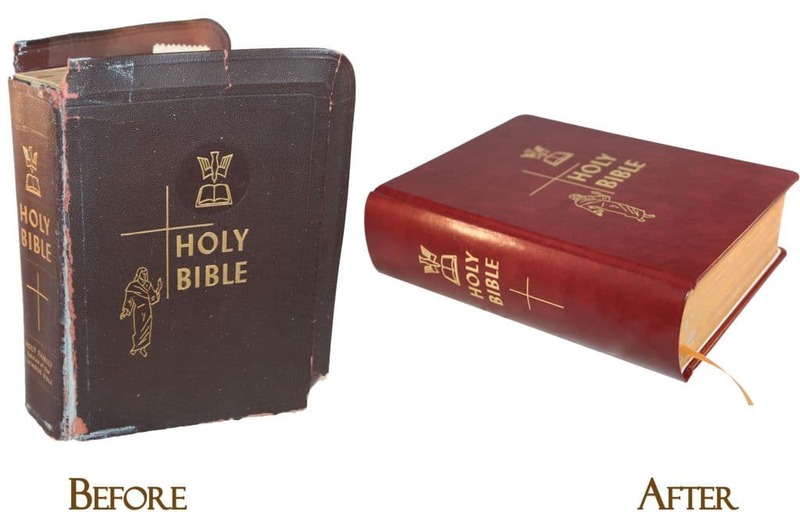 These photos show numerous ways we perform Bible recovering for Bibles with zippers and create beautiful new covers. These examples also show how our bookbinders convert crosses attached to the zipper to become attached to bookmark ribbons. Hot foil stamp names, text or images. We have "in-house" images or create your own custom die stamps.